The Vol. 8, No. 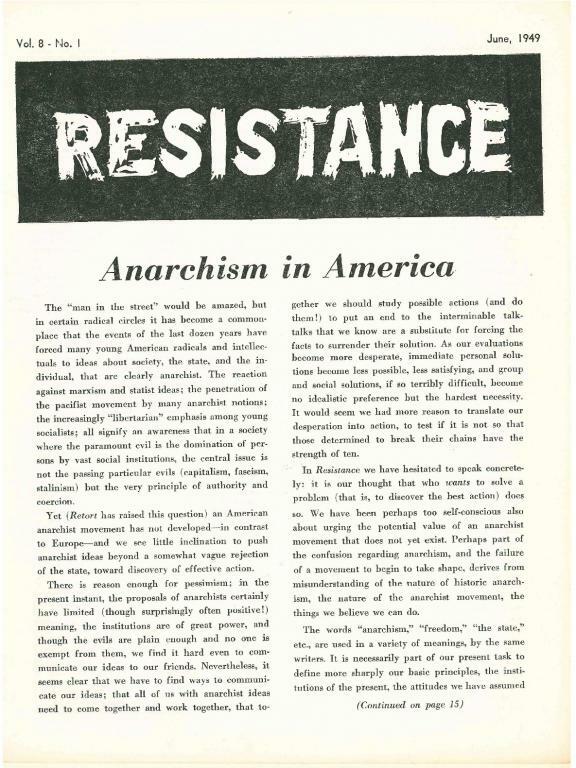 1 (June 1949) of Resistance, an anarchist publication produced out of New York. -A note on happiness by D.E. If you think some things have changed....read "To Our Readers" in this issue. That's both sad and funny. 60 years later nothing has changed. Quite literally the same arguments. Apparently, Paul Mattick and the Resistance group also exchanged disagreements about collective vs individual action in a series of public events in the 1940s or 1950s if I remember correctly. In reference to the 'To Our Readers' section, I suppose they are both right. The IWW has often had an ugly and contradictory economistic stance. On the other hand, the anarchist scene during this time, and it was not limited to the groups around Resistance, were sometimes preoccupied with intentional communities, psychology, diets etc.